Hi Sue, nice to meet you! My name is Sue and I am 45 years old. I have been working with Sonam Targee, an Ayurvedic and Traditional Chinese Medicine herbalist, for 11 years. I consider him my primary health care practitioner. He has also become a dear friend and teacher. As he would say, I am a “Kapha Gal.” When I first went to see him, my Vata was so out of whack that I palpated through most of each day. At first, I simply did whatever he told me to do. I didn’t understand Ayurvedic principles. But then others of my group started to go to him for consultations. And he came out and conducted seminars. So I have a better grasp on it now. I’ve come to appreciate how hard it was to pacify the Vata imbalance without aggravating my Kapha overmuch! I’ve slowly brought my lifestyle more around to align with Ayurveda. I’m a work in progress, though, so there’s more to be done. 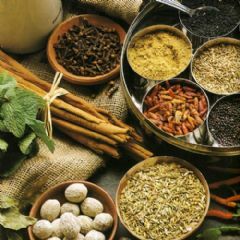 I look forward to getting to know you folks who are working on diet changes in an Ayurvedic framework. This is my first post to a message board – ever. So let’s hope I don’t delete it or post it five times.